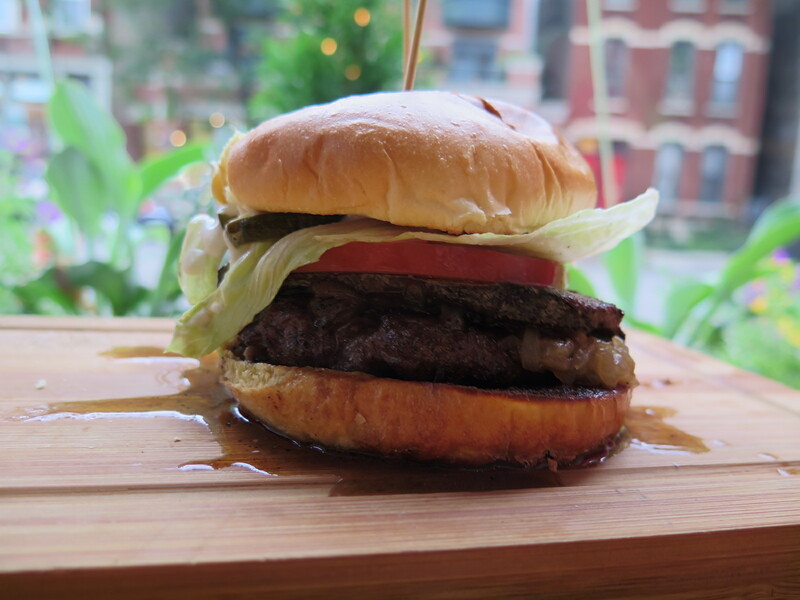 Lincoln Park is home to some awesome dining staples: Sweet Mandy B’s, Alinea, Boka, and more. However, a newcomer (but not really) to the game is the The Butcher and The Burger. Considering how many times I’ve walked past this restaurant and haven’t gone in, is a complete travesty. Having a serious focus on being “green” and utilizing “all natural” local products, B&B makes it a goal to purchase items and use merchants in the Midwest (excluding fish). Everything from the bread they use, to the black truffle puree, to even the foie gras they lather on, is all from around town. B&B doesn’t even serve Styrofoam or plastic utensils/containers in an effort to stay as “green” as possible. One thing that separates B&B from the rest is hands down the ample amount of flavor. That secret ingredient is none other than their “house blended” natural seasonings, which are prepared daily. A generous sprinkle of seasonings is added to every protein before it hits the char broiler. Since this is a neighborhood favorite, I decided to try the house blended beef with the house seasonings, only topped with goat cheese, lettuce, tomato, pickles, black truffle aioli, and sautéed foie gras. 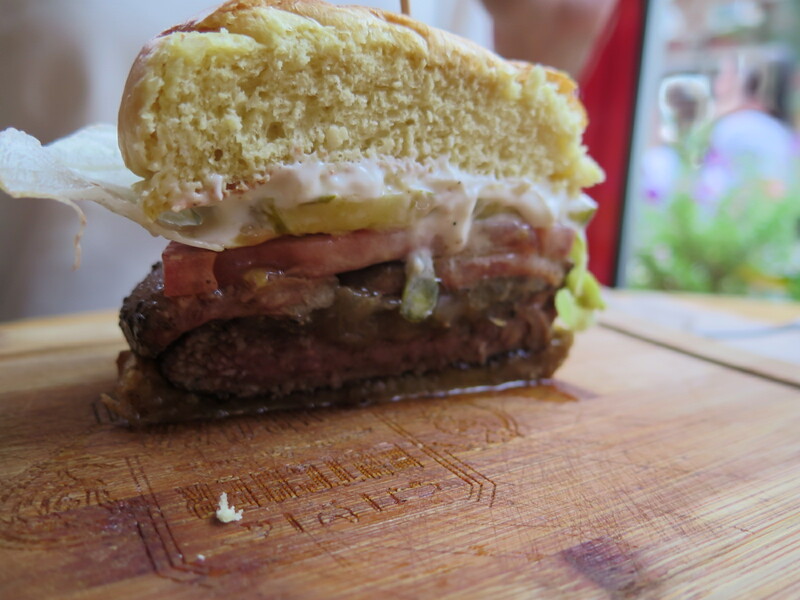 Between that thick layer of oozing foie, the earthy notes of black truffles, and the juicy piece of beef, this burger was hands down the best BYO burger I’ve ever constructed. To test the waters on a slightly different type of protein, I decided to try out the grass fed patty next. 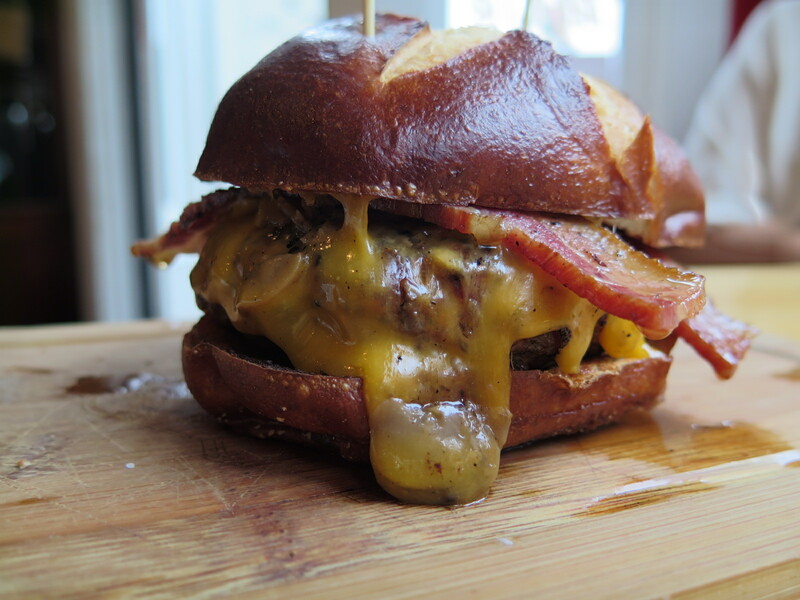 Layering the extras of cheddar cheese, grilled onions, griddled mushrooms, and a giant slab of smoked bacon in between a toasted pretzel bun, the flavors of this burger hit my taste buds in every direction, making my mouth water for MORE. In addition to the main course, are my favorite parts of the menu: the sides. 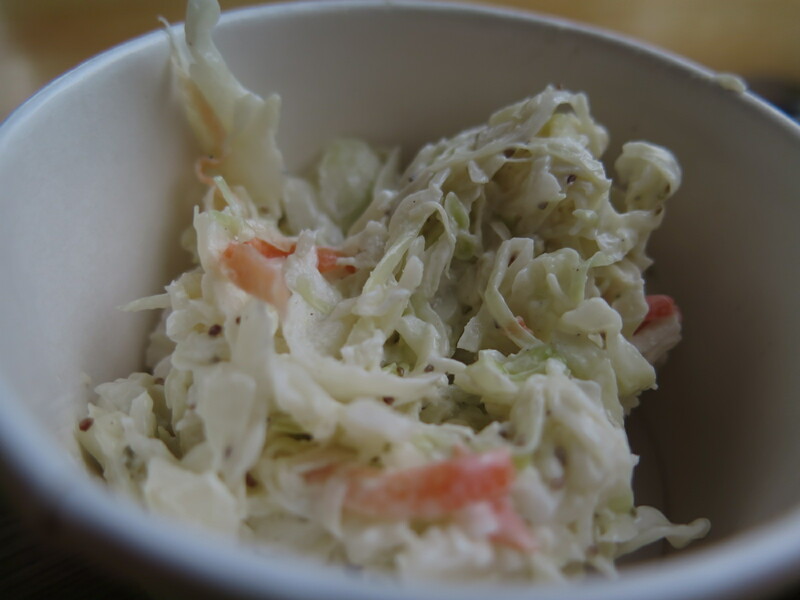 Out of the many options, my favorites were the potato salad and the coleslaw. Although not necessarily the most eye appealing, each dish was packed with incredible amounts of flavor. 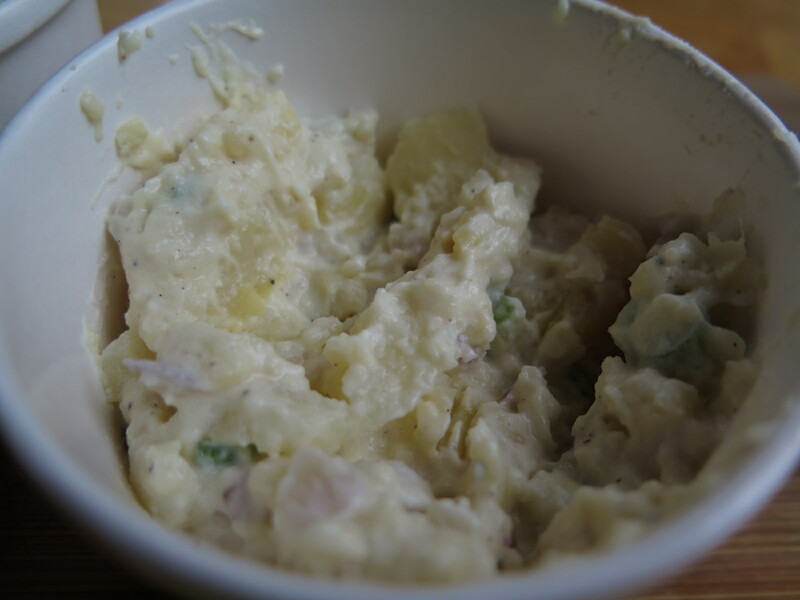 Traditional as they make it, the potato salad was perfect. Hunks of chopped potato lathered in mayo and other special ingredients is my version (as well as “my people’s” ) form of comfort food. The coleslaw on the other hand was not only creamy, but it was semi sweet, a perfect entryway to a salty and juicy burger. While burgers are mostly why B&B has a line out of the door, it also offer proteins in the shapes of meatballs, loaves, and patties from the butcher case to take home if you feel like making dinner yourself. Whether you order a made-to-order meal in shop or take food home, Butcher & the Burger is literally, the perfect stop for any occasion.